Have you had a craving so strong and specific that it took you many attempts and months to satisfy? The recipe was born from chasing such a craving. I am not sure if this craving was pregnancy induced or pregnancy intensified. 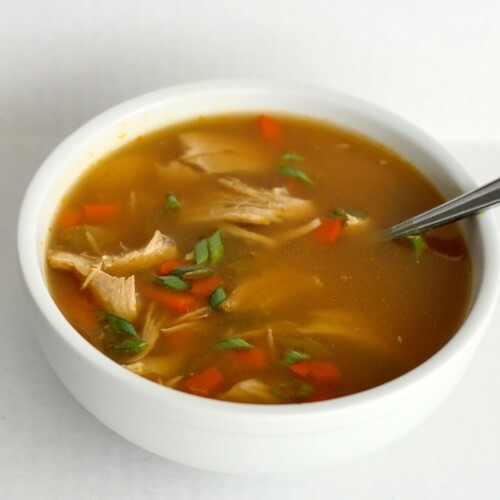 Cravings and pregnancy seem to go hand-in-hand so it could that being pregnant intensified my longing for a homey chicken and noodle (or rice) soup that had a deeply flavorful broth. Copycat recipes are easier to develop because you have something you can compare your results to. I wish that was the case with this soup. I wish there was a soup outcome that I could compare all my failed soup attempts to. The only thing I could compare my soup attempts to was an idea of a flavor. Nothing tangible. I knew my soup needed ginger and garlic. I knew that there also needed to be a slight salty soy sauce flavor too. These three ingredients were present in all my attempts in varying proportions, but each time it fell flat. The soups were good. My family happily gobbled them up but I was sitting there still wanting something more. With this attempt I stopped and thought a minute about the ingredients that are present in some of my favorite Asian foods. When I make potstickers I like to dip them in a soy sauce and rice vinegar mixture (try it!) which has an awesome tangy sour/salty flavor. When I make stir-fry I sometimes use fish sauce which is another salty -umami flavor. Into the soup pot it was going to go! There needed to be a spice added. Something that would hit your nose before your tastebuds. I wasn’t exactly sure what this was going to be. I danced around the idea of adding cinnamon sticks to the broth but it just didn’t feel right. After all I was really making this soup based on intuition. So when I opened up my spice cupboard I saw a jar of star anise sitting off to the side, I grabbed it, opened it up, and breathed in the licoricey smell. This I believed, was the ingredient that would round out my broth. Star anise is used in Chinese five spice powder and in pho. It just seemed to make sense. I threw all my ingredients in and let them simmer away. The smells coming from my kitchen were heavenly. After trying the broth for the first time I nearly cried (lets just blame it on the pregnancy hormones, ok?). This was exactly what I had been craving for months! I ladled up myself a couple bowls worth then added sauteed baby portobello mushrooms to the soup pot for my family (I’m allergic to mushrooms –boo) since they needed to be used up within the next few days. The soup was served over brown rice and it all worked so well together. The only request for change that I had was from Sasha, she said next time I should use ramen noodles, and I totally agree they would be delicious in this soup. So cozy up to rich and warming bowl of soup this winter. You’ll be glad you did. Place all ingredients into a large pot and bring to boil. Cover pot with lid and turn down to medium-low. Simmer for 1 hour. Occasionally skimming off any foam that appears. After 1 hour of simmering remove chicken breasts and scoop out onion, garlic, and star anise or pour broth though a strainer. Careful it is hot! Return broth to a boil. Add in carrots and soy sauce. Boil for about 10 minutes or until carrots are soft. Turn down to low. Stir in sautÃ©ed mushrooms and most of the green onions, saving some for garnish. 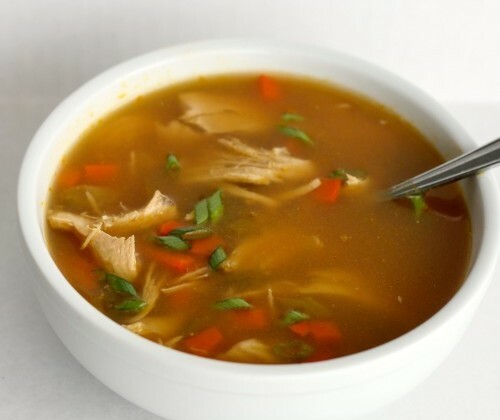 Add one scoop of brown rice to the bottom of a soup bowl. Ladle in soup over the rice. Garnish with reserved green onions. this is definitely my kind of soup! love it! This soup looks great, I’m obsessed with Asian soups, especially with ginger! Soy sauce and rice vinegar sound so good together, maybe throw in some sesame oil too? !